This place came highly recommended – from a fellow Greek no doubt! 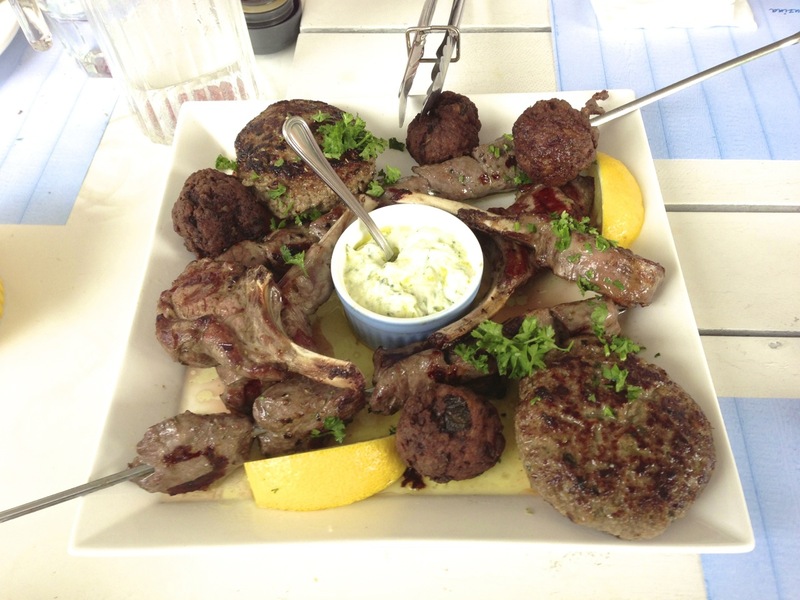 Blu Kouzina features traditional Greek fare. From pita with Tzatziki, to grills and complete with sweets that make the diabetics squirm, this place has it all. First up, some pita bread and Tzatziki. Tzatziki is a classic Greek dip that features a Greek yogurt mixed with cucumber, dill, garlic and extra virgin olive oil, seasoned with salt. We were seated outside without the comfort of air-conditioning and this dip was really refreshing for a hot day. 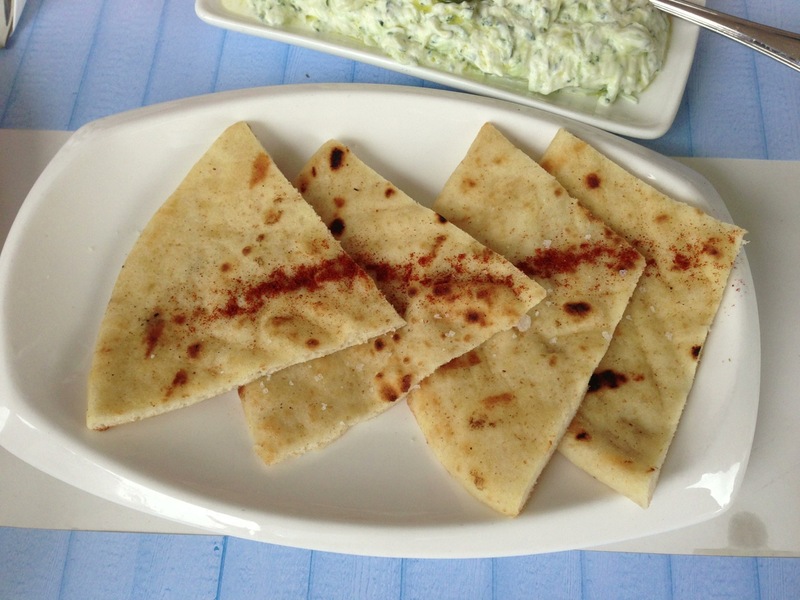 It is eaten with the pita bread, and is a refreshing start to the meal. 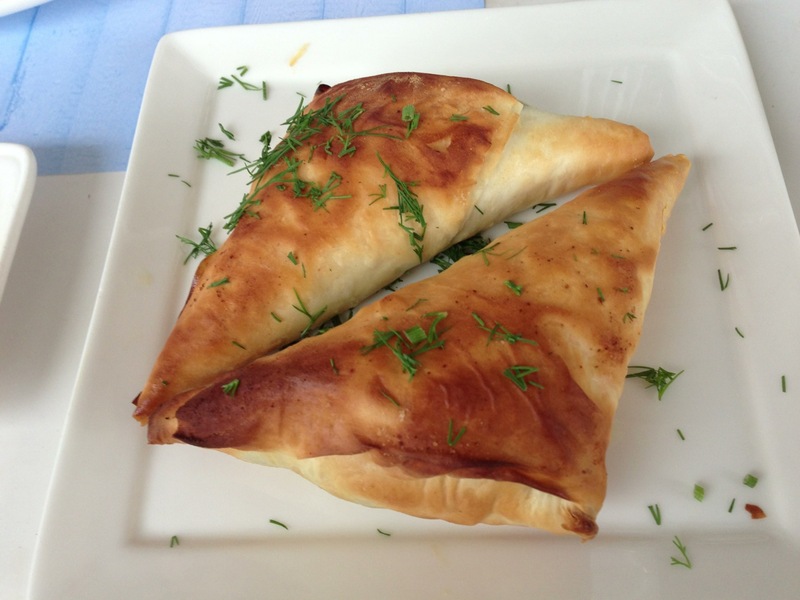 Spanakopita is a spinach filo pastry that is similar to our chicken pie in texture. My sister remarked that it tasted like India curry puff, but with a spinach filing. Little princess loved it so much that she finished most of the lot. Overall the pita (yes, it belonged to the same family) was fluffy and filing is savoury. And the portion was not too big that it overwhelmed the whole meal. Great starter. The Kreatika Anamikta (mixed meat platter) for 2 featured 4 pieces of lamb chops, 4 meat balls, 2 Kalamaki Souvlaki and 2 Bifteki with a side of fries. Bifteki is a beef patty that is similar to a hamburger patty, except the Greek really know their stuff. The minced beef is seasoned with herbs and spices, and grilled to perfection. Souvlaki is like a kebab on metal skewers and grilled on open fire – a chunkier version of our satay with slightly marinated meat. Greek meat balls or Keftethes are miniatures of the Bifteki in this case. The platter came with Tzatziki dip and was great to share among 4. Moussaka is an eggplant-potato casserole dish that is similar to lasagna. Instead of pasta, the eggplant and potato provided the starch that bonded the whole dish together. Baked with a minced meat tomato paste, it would be mistaken easily with lasagna, although the 2 are of totally different origins. This moussaka was actually quite light and fluffy, and the white sauce was a great complement. 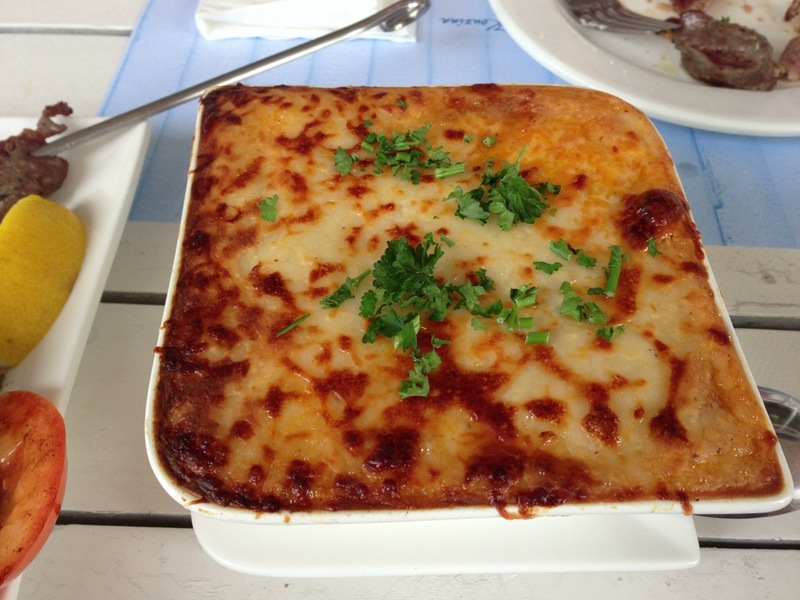 Unlike its Italian cousin, moussaka was much lighter and we finished every last bit of it. 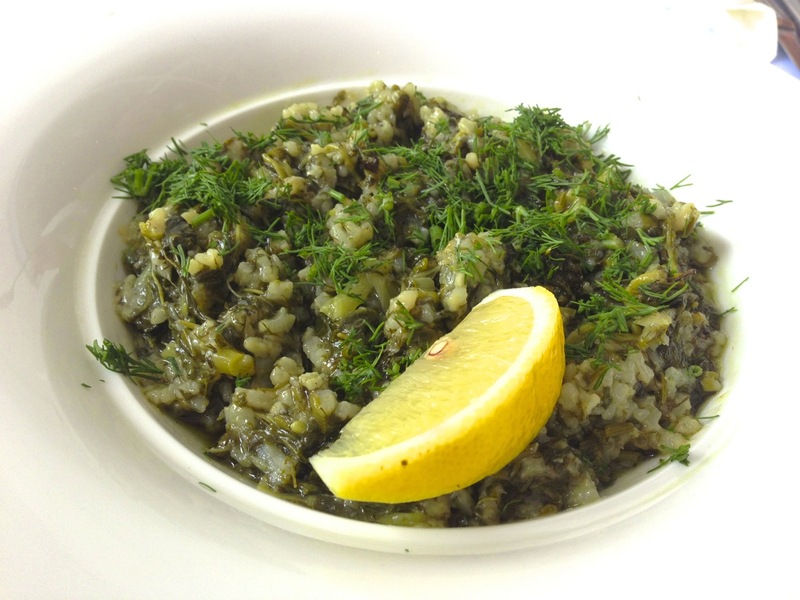 Greek spinach rice or Spanakorizo is another Greek staple. 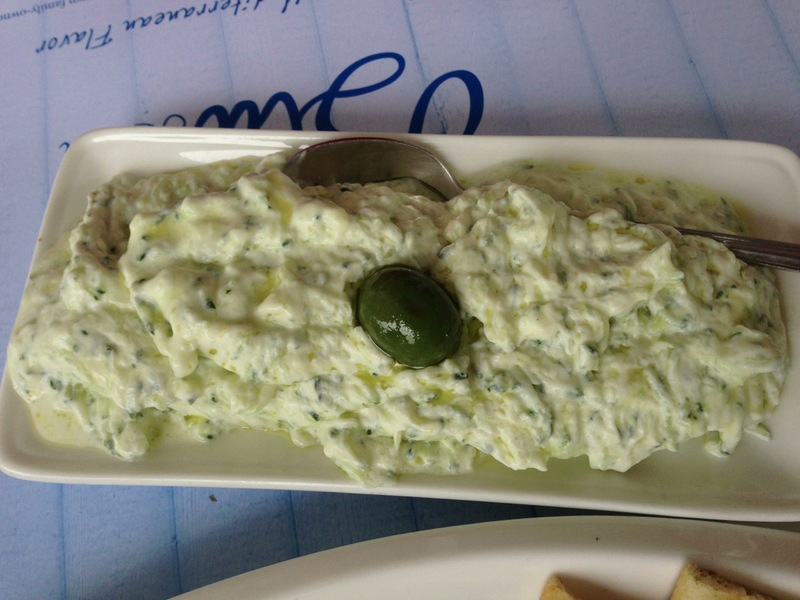 Spanakorizo is made from rice with lemon, dill and feta cheese. Like an Italian risotto, it was fluffily and quite cheesy. The salty taste of feta and zesty lemon were not agreeable to most of us on the table, and so this was the least enjoyed dish of the day. Grills are a Greek favourite treatment of meat and seafood. 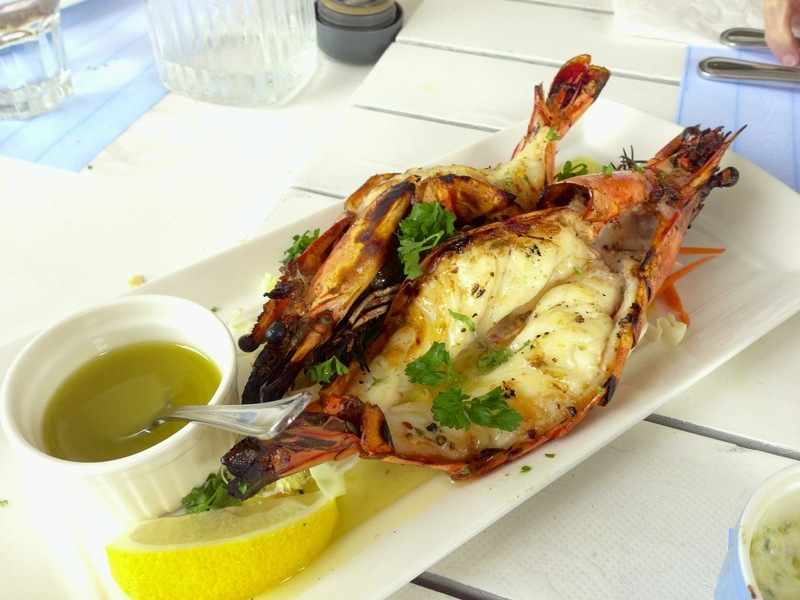 The king prawns were marinated overnight in salt and olive oil before grilling. They were flavourful. Sis, the great connoisseur of fresh seafood, was first to notice that the king prawn were not exactly freshest of fresh. But the marination did the magic and covered the frozen taste of the prawn. Of course that last bit did not escape her delicate tastebuds. That’s for growing up by the seaside and used to the freshest seafood growing up. 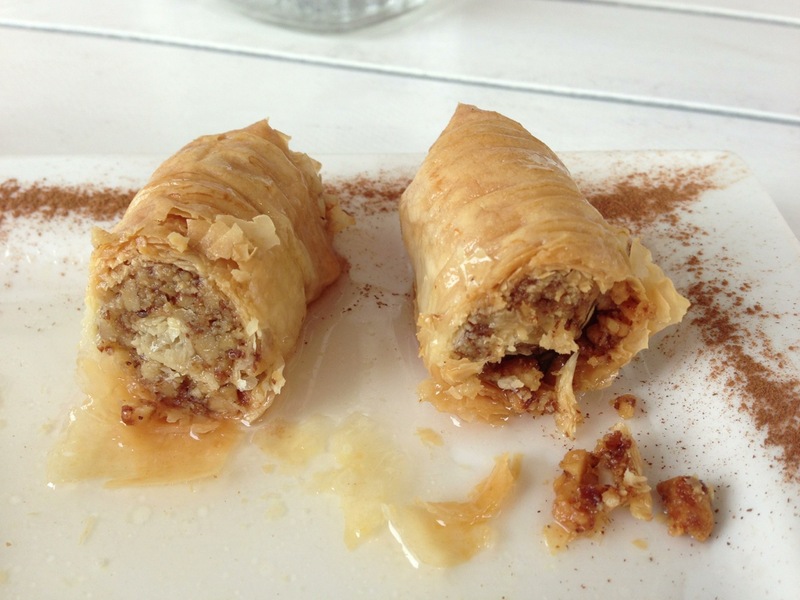 Baklava is a filo pastry filled with nuts and sweetened with syrup – lots of syrup. In fact, their recipe feature the pastry soaked overnight in syrup. Now that’s a sugar overdose for you. 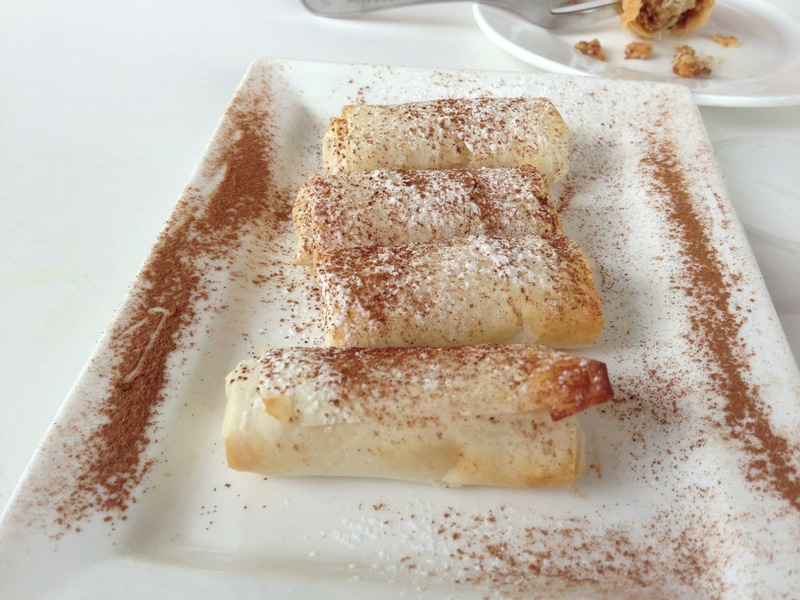 Bougata is a filo pastry with custard filing sprinkled with icing sugar and cinnamon powder. We like this better than the Baklava, not because it tasted better, only because we had a lesser sweet tooth. 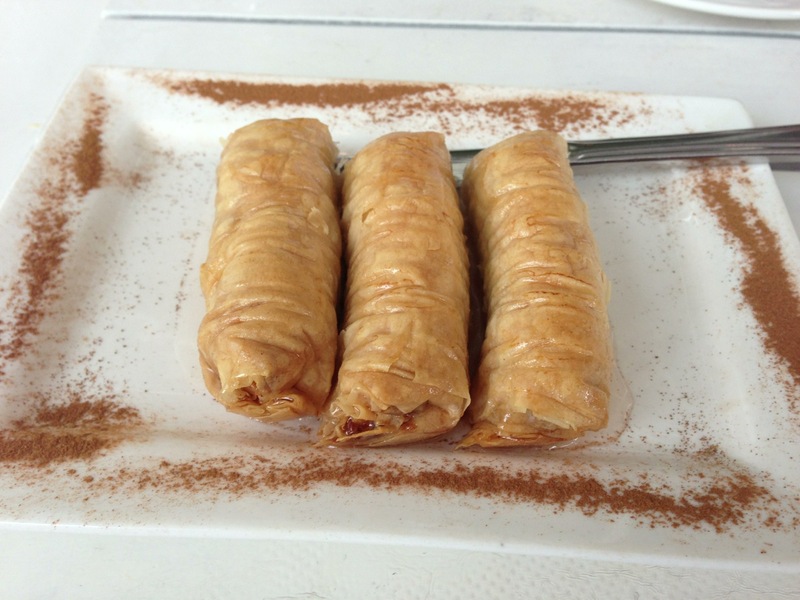 The Baklava is like drinking honey undiluted – great but not too much. Bougatsa is like a hot custard pie that in comparison was not as sweet. The owners of the place were friendly, and they were constantly concerned that we may not be accustomed to Greek fare. *We were the only Chinese family there that afternoon. We loved the grills, and if we are too lazy to get a BBQ going, this is where we will go to get our char-grilled meat fix. The price is above the average, we paid $55++ per person for lunch. The service staff was attentive. Overall, a friendly atmosphere, good food that makes you want to go back soon.